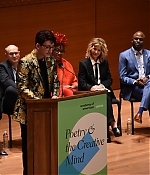 On April 19, the Academy of American Poets will hold its annual Poetry & the Creative Mind celebration at Lincoln Center’s Alice Tully Hall, hosted by Meryl Streep. 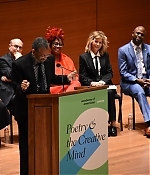 The event celebrates poetry’s important place in our culture and its impact on the lives of readers, and features leading and legendary actors, dancers, artists, musicians, and public figures on one stage sharing their favorite poems. 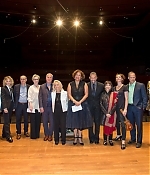 The always inspiring evening is a benefit, which raises funds to support the educational programs of the Academy of American Poets. 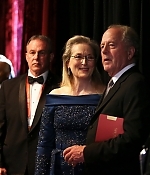 Meryl Streep is a longtime supporter of the Academy of American Poets, having attended the Poetry & the Creative Mind seven times between 2004 and 2014. You can learn more about the academy and her previous appearances here. For tickets and more information about the April 19 event, please visit their official website. Many thanks to Frank for the heads-up. 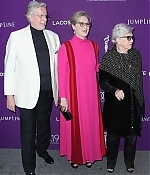 The 89th Annual Academy Awards will go down in history for its shocking false announcement in the Best Picture category, which made one forget about the pointless Lagerfeld tabloid story (although Jimmy Kimmel couldn’t resist to ask, “nice dress. Is that an Ivanka?). Kimmel pulled no punches during his opening monologue, joking that the 20-time-nominee was getting a bit too much credit for her acting chops. 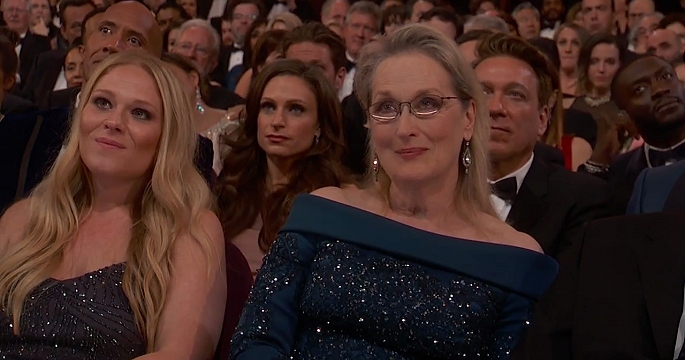 “We’re here to honor the actors who seem great, but actually really aren’t. And of all the ‘great’ actors here in Hollywood, one in particular has stood the test of time for her many uninspiring and overrated performances,” Kimmel dead-panned. 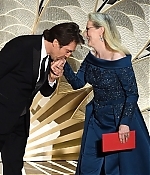 “From her mediocre early work in ‘The Deer Hunter’ and ‘Out of Africa,’ to her underwhelming performances in ‘Kramer vs. Kramer’ and ‘Sophie’s Choice,’ Meryl Streep has phoned it for more than 50 films over the course of her lackluster career.” Kimmel finished things off by asking everyone else in the auditorium to show their appreciation for the actress. 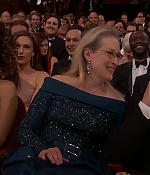 “This is Meryl’s 20th Oscar nomination,” he pointed out. “Made even more amazing considering the fact that she wasn’t even in a movie this year, we just wrote her name down out of habit. 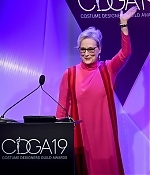 Everybody, please join me in giving Meryl Streep a totally undeserved round of applause.” The evening went as expected – until its very unexpected end – with a Best Supporting Actress Oscar for Meryl’s friend Viola Davis and Javier Bardem paying tribute to Meryl’s performance in “The Bridges of Madison County”, before joining her on stage to present the Best Cinematography category to Linus Sandgren for “La La Land”. 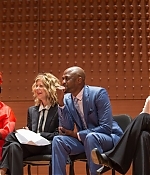 Pictures from the (apparently very brief) arrivals and the show have been added to the photo gallery. Many thanks to Lindsey for her contributions. Enjoy, and goodbye to the 2017 awards season! 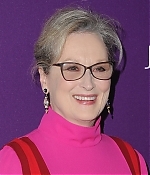 Meryl Streep has attended Friday’s 10th Annual Women in Film cocktail party on the same day she has become tabloid fudder (let’s just not talk about it). 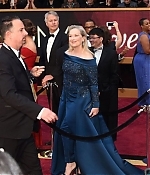 Streep slipped past the press line, momentarily pausing to affectionately refer to BBC News as “another beauty” (a subtle dig at President Trump, who had pointed at a reporter from the outlet during his recent press conference and proclaimed, “There’s another beauty”). 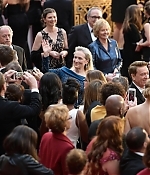 The actress made her way inside the party and blended into the crowd — and then, folks demanded a speech. So she obliged. “I feel like never saying anything again … forever,” she joked. “Because everybody is speaking up and that’s great. Because with the numbers, they can’t ignore us. 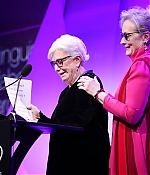 And we are 51 or maybe 52 percent now of the population.” Streep went on to share a quick story about her high school years and how an exchange student from Afghanistan reminded her of how far women around the world had come. 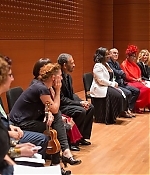 “Stuff can change, and you have to really feel the earth move under your feet,” she noted. Many thanks to Glenn for the heads-up. According to the Hollywood Reporter, Meryl Streep will have another opportunity to confront president Donald Trump (I think she won’t) at the 89th Academy Awards on Sunday. The actress, who has earned more nominations than any other actor in history from the Academy, famously called out Trump during her acceptance speech for the lifetime achievement award at the Golden Globes in January, in which she chastised the president for mocking The New York Times’ Serge Kovaleski, a disabled reporter. 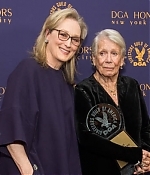 Streep also defended her anti-Trump speech, as well as voiced support for transgender rights, at the Human Rights’ Campaign 2017 Greater New York Gala dinner earlier this month. Now, the Academy has officially announced that Streep will be one of the presenters at the Oscars on Sunday night. Also announced as presenters were former Oscar winners Matt Damon, Faye Dunaway, Warren Beatty and Octavia Spencer as well as Oscar nominees Ryan Gosling, Salma Hayek, Dev Patel, and Taraji P. Henson. 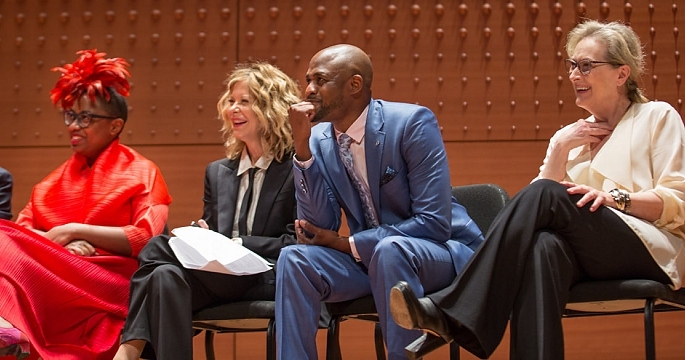 Jason Bateman, Vince Vaughn, Jennifer Aniston and Sofia Boutella will also present. Many thanks to Frank for the heads-up. Happy New Year everybody! 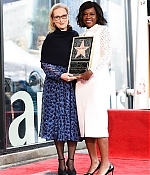 Today, Meryl Streep has joined colleague and friend Viola Davis to celebrate Davis’ star unveiling at the Hollywood Walk of Fame. A first batch of pictures have been added to the photo gallery with more to come. Edit: Over 200 additional pictures have been added, as well as a video of the whole ceremony below. 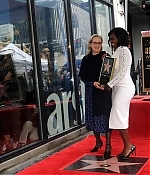 At the ceremony, Streep said, “Viola Davis is possessed. She’s possessed of a blazing, incandescent talent. 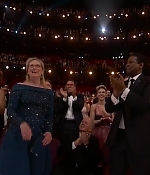 She is, arguably, the most immediate, responsive artist I have ever worked with.” And an emotional Davis, who won a Tony for her Broadway performance in Fences and is now frontrunning a Best Supporting Actress win at the Academy Awards, said, “I cannot believe my life right now.” Meryl’s introduction starts around 7:50 minutes. 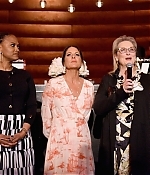 On Thursday, Meryl Streep has attended the Christopher & Dana Reeve Foundation’s A Magical Evening Gala at Cipriani Wall Street in New York City. 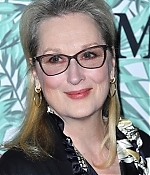 Meryl’s sighting comes a day after news that her turn on the upcoming television miniseries “The Nix” will bring her a whopping $825,000 per episode, according toThe Hollywood Reporter. Makes one wonder how many episodes there will be. 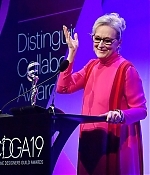 Streep’s handsome salary places her among a growing list of top-notch performers who have been lured to the small screen thanks to the popularity of original content streamed by the likes of Netflix and Amazon.